August is a wonderfully warm month full of sunshine, long summer days and the occasional free hour to craft. This week we are sharing two sunshine ideas, perfect for you August DIY home decorators and papercrafters. Custom home decor really makes a space yours. We found this cute printable from on Eighteen25 and thought it would look amazing printed on Birch Wood Paper. We were right and it is certainly going to brighten up our home. All you need is an inkjet printer, this free file, and one sheet of Birch Wood Paper. Print, frame and enjoy! Need a card idea to send in August? This darling pinwheel sunshine card is just the ticket. 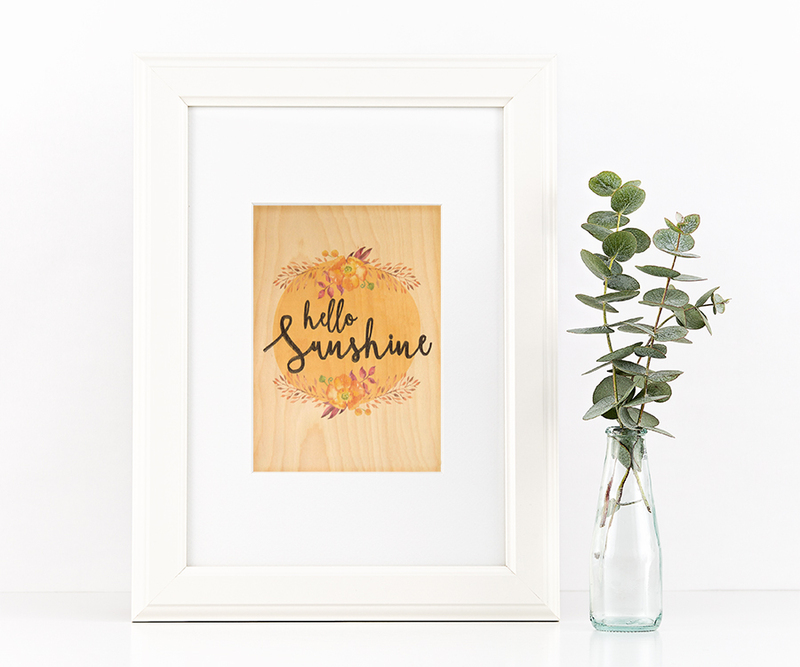 The warmth of the various wood tones adds to the sunshine message. Supplies below. Happy Summer. Supplies: Cherry Wood Paper, Birch Wood Paper, Birch Wood Address Labels, pattern paper, button, sunshine word cut file, e-cutter and adhesive. This entry was posted in DIY Projects, Home Decor, New Seasonal & Special Occasions, Stationery & Envelopes and tagged birch, cherry, crafts, et cetera.